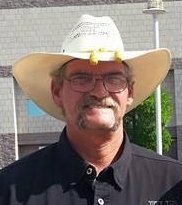 Obituary for Curtis David Easterwood | McCombs Funeral Home Inc.
Curtis Easterwood, age 57, of Buhl, Alabama., passed away Tuesday, March 26, 2019 in Cape Girardeau, Mo. after a valiant battle with cancer. He was born June 23, 1961 in Anniston, Alabama, the son of the late Paul and Willette (Andrews) Easterwood. He married Bonnie Hix. Curtis graduated from Tuscaloosa High and went to work in the construction trades. He worked on many different projects throughout Alabama before joining Berkel Construction in 2001. His job as a foreman for Berkel took him all over the country. One such job brought him to Cape Girardeau where he worked at the P&G plant pouring footings for the expansion of the paper towel line. While there he met the love of his life, Bonnie, and they were married on March 5, 2002 in Louisville, Ky.
Curtis will always be remembered by his family and friends as a man with a heart of gold. He was a wonderful husband, father, grandfather and brother. His special joy was riding his Harley Davidson motorcycle. Loving survivors include his wife, Bonnie; three sons, Justin Easterwood (Jerrica) of Monticello, Ark., Bradley Easterwood (Paula Joann) of Holt, Alabama and Dave Cline of Cape Girardeau, Mo. ; two daughters, Jessica Hall of San Antonio, Texas and Shantel Steffens of Duquoin, Ill.; three sisters, Paula Haynes (Carl) of Northport, Ala., Jackie Baisden (Lee) of Buhl, Alabama, and Linda Langston (Jimmy) of Clanton, Alabama. Also surviving are 12 grandchildren. He was preceded in death by his parents, a brother, Randy Easterwood; and a nephew, Jeremy Baisden. The family would like to extend a special thank you to Joy Cline and Paula Keller for all of their love, kindness and support throughout this difficult time. Friends may call Saturday from 4 – 8 p.m. at McCombs Funeral Home in Cape Girardeau. Funeral service will be Sunday, March 31, 2019, at 1 p.m. at the funeral home with the Rev. Wavis Jordan officiating. Interment will follow in Russell Heights Cemetery in Jackson, Mo. Memorial donations may be made to: Southeast Hospice, #10 Doctors Park, Cape Girardeau, MO 63701.